In his latest book, Getting to Yes With Yourself, William Ury offers a practical six step way to effectively conduct difficult negotiations. Ury is co-founder of the Harvard Program on Negotiation and one of the world’s best known and most influential experts on negotiation. Ury has served as a professional negotiator and mediator in conflicts ranging from boardroom battles and family feuds to civil wars. He is the co-author, together with Roger Fisher and Bruce Patton, of Getting to Yes, the best selling book in the world on negotiation. His suggestion is that the greatest obstacle to successful agreements and satisfying relationships is not the other party. The biggest obstacle is us—and our natural tendency to react in ways that do not serve our true interests. Ultimately, negotiation is an exercise in influence. Getting to Yes With Yourself explains how to effectively influence yourself, so you can more effectively influence the person you are negotiating with. How? 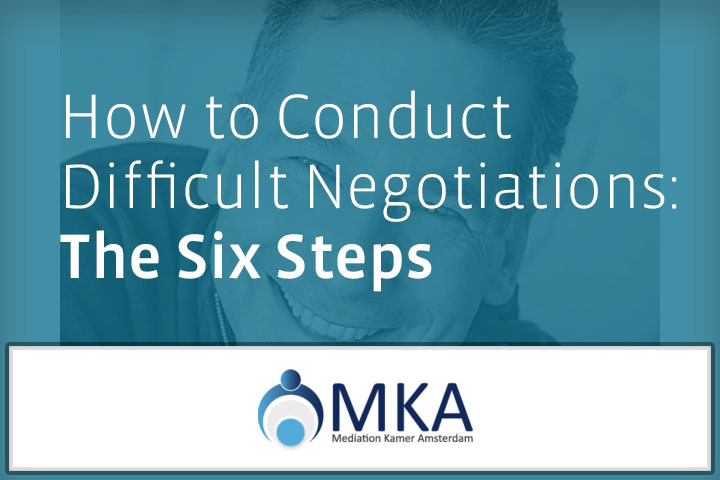 Imagine you are about to enter into a tough negotiation or difficult conversation. Let’s say, the renewal of a contract that is very important to your company. Or maybe a meeting with a business partner who has not held up his part of the deal. Or that talk with your boss about the promotion you did not get. You have prepared diligently. You have acquired detailed information about the subject matter. You know what you want and you know what you can afford to give away. You have a pretty good idea who the person sitting at the other side of the table is, and you think you know what he wants from you. Also, you have researched what other options you have in case negotiations fail. Your focus will be on searching for mutual gains and achieving a solution that is fair and reasonable. You will be forthright about what your concerns are, but with a clear intention to do so in a respectful and civilized manner. Then the conversation takes an unexpected turn. The other party might get personal or behave rudely. They present unreasonable demands. Or they seem to have information you do not. So you start thinking they are lying or playing dirty tricks. Or you silently scold yourself for missing a vital piece of information, giving them advantage over you. Whatever the reason, you feel your red buttons are being pushed. Repeatedly. You start to feel angry, resentful or frustrated, making it difficult to think clearly. And then it happens. You start behaving in a way that is neither constructive nor serves your interests in any way. Like raising your voice. Not listening. Maybe even walking out of the room. You hear yourself saying things which are not the products of deliberate and rational decision making processes, but rather small uncontrolled outbursts of whatever negative emotions you are experiencing at the time. You hear yourself making threats. Responding to personal attacks with personal attacks. You say things like ‘I quit.’ Or ‘We will let a judge decide that.’ Which, by the way, may be perfectly sensible things to say if they are part of a carefully thought out strategy to advance your goals. Not if said in the heat of the moment, wishing you had not said them the next day. I personally recall walking out of such meetings. Having a very clear sense that what just happened did not bring me any closer to what I wanted. I remember feeling frustrated and angry. Justifying the way I contributed to the conversation by saying to myself that the other party was being unreasonable, unfair or lacking in intelligence. The thing is, it is rarely the other person who’s the problem. Even if they are being unreasonable, unfair or not behaving very intelligently. Chances are that the problem is you. And the way you react to the person sitting at the other side of the table. This is the message in Willliam Ury’s book Getting to Yes With Yourself (and Other Worthy Opponents). In 1981, together with Roger Fisher and Bruce Patton, William Ury wrote the best selling book in the world on negotiation, Getting to Yes. Getting to Yes offers a method of “principled negotiation”. A way of conducting negotiations based on interests and with a “mutual gains” approach. If negotiation is about how to get what you want, Getting to Yes is about how to effectively deal with other people and how to reach agreement with them in order to get what you want. With millions copies of the book in circulation around the world, it helped transform the popular mindset for dealing with difficulties from “win-lose” to “win-win”. But in the years after he wrote Getting to Yes, Ury saw how many people still struggled. Even those who had learned the basics, reverted back to costly and damaging win-lose methods when faced with conflict or difficulty. Attributing this to the necessity of dealing with difficult people. In fact, William Ury came to realize something was missing. And what was missing he found, was a guideline to the first and most important negotiation anyone ever conducts. The negotiation with ourselves. So thirty years later after writing Getting to Yes, William Ury wrote what he calls ‘the missing half of Getting to Yes’. If negotiation is about getting what you want and Getting to Yes is about how to deal with other people, Getting to Yes With Yourself is about you. More specifically, about how you often get in your own way, becoming your own biggest obstacle. And how to effectively deal with yourself in order to get what you need. One way to use the book is to review the six steps before an important conversation or negotiation. Better is to see it as a daily practice. As does The 7 Habits of Highly Effective People, written by the late Stephen Covey, the book aims to offer you a set of life skills to live and work well with others, from learning to live and work well with yourself. When asked what would be the most important skill for a negotiator or mediator, William Ury would pick the ability to put yourself in the other person’s shoes. This may sound easy, but in real life this is actually one of the hardest things to do for the average person. Especially when faced with conflict. One key prior move that helps you to do this, is to put yourself in your shoes first. Why? Because really knowing what you want and need clears your mind. It gives you the mental and emotional space to be able to listen to the other person and understand what his needs are. How? Three actions can help. If faced with a difficult situation, go and stand on the balcony. This means metaphorically remove yourself from the stage and watch the scene from a distance, as if you were watching a play. This creates perspective. Compare it to pushing the “save as draft” button instead of immediately hitting the “send” button after writing an angry email. (Or worse, accidently pushing the “reply to all” button and sharing your emotional outburst with everyone in the company). Applying the principle to yourself, it means silently observing what happens inside. What am I thinking? What am I feeling? The point being that neutrally observing and identifying your thoughts and emotions (without condemning yourself for it) helps you stay in place. And not get carried away by them. Al this negative chatter in your head can cause you to get unbalanced and distracted. Steady yourself. Instead of criticizing, listen to yourself with empathy. The way you would listen to a friend or trusted business partner. Essential to getting what you want is knowing what you want. Sometimes we think we know, but we don’t. Not really. This makes it hard to reach a satisfying outcome. How do you expect to get what you want if you don’t know what you want? Uncover your underlying needs by asking yourself the magic question “why?”. And after every answer, ask “why?” again. As many times as necessary to get to your fundamental, bedrock need. Be especially attentive of recurring feelings of disappointment or dissatisfaction. They often indicate unmet concerns and interests. A familiar term in the field of negotiation is BATNA, your Best Alternative To a Negotiated Agreement. Meaning, what options do you have and which one serves you best if you cannot reach a deal? One great advantage of knowing your BATNA, is that it gives you confidence. The confidence that no matter what happens in a negotiation, you have a good alternative. Develop your inner BATNA. Make and keep a commitment to yourself to take care of your needs independently of what other people do or not do. “Is the universe a friendly place?” was the question Albert Einstein supposedly asked in the wake of World War II. In his opinion “the first and most basic question all people must answer for themselves.” Why? Because if we believe the world to be a hostile place, we will naturally treat other people as enemies. If on the other hand we adopt the working assumption that the universe is friendly, we will more likely take a cooperative approach and treat others as potential partners. Most of us are programmed to fear scarcity. If people think there is not enough to go around, conflict starts. Do not let a mindset of scarcity rule your life. Reframe your picture. See life as being on your side, even as it seems unfriendly at times. Do you remember the last time you experienced it? Being completely involved in a task or activity, with a feeling of total control and focus. Professional athletes call it “the zone”. Psychologist Mihaly Csikszentmihalyi wrote a celebrated book it, calling it ” flow“. A psychological state of high performance and inner satisfaction. Essential to reaching this state of “flow” is to be fully attentive in the present moment. As opposed to getting lost in thought about what has already happened or worrying about what to do or say next. Assume this attitude towards life in general. Do not get lost in resentments about the past or anxieties about the future. Stay in the present moment. The only place where you have a chance to change things. The cheapest concession you can make in any negotiation is to give respect. Meaning nothing more than to give positive attention and treat the other in a way you would like to be treated. Be polite. Listen. This is difficult to do when faced with conflict. Especially if the other party does not seem to respect us back. After all, our automatic response is to reject when we feel rejected, attack when attacked, to meet exclusion with exclusion. Expand your circle of respect and include those who are difficult to respect. Surprise them by meeting exclusion with inclusion, rejection with acceptance. Respect them even if they are difficult. Break the cycle. Stop focusing on meeting only your needs. Give first instead of taking. One practical reason for it is the power of reciprocity – if you give something, the person at the receiving end will be inclined to give something back. But the benefits go well beyond material reasons. A great number of recent psychological studies on happiness and well-being have identified “giving” as one of the key behaviors that lead people to experience more happiness and satisfaction in life. Give intelligently and be mindful of those who only take. Give, not only to receive but for pleasure and meaning. One very good reason to read the book is to draw on the personal insights and experiences of one of the masterminds of negotiation and mediation. The book offers a practical and useful guide to prepare yourself for any difficult negotiation or discussion. But the book offers more than that. It may help you shift from an adversarial approach to more cooperative methods of dealing with difficulties. Not only in business disputes, but at work, at home, in any relationship or situation. I think we need to try and do this. Sometimes, it seems like everyone is playing the blame game. It is as if we feel the world is an unsafe place and our decisions are ruled by fear of scarcity. So we meet exclusion with exclusion, attack with attack, rejection with rejection. Someone needs to break the cycle. Reading about it is easy. Actually doing what the book says is, as I have experienced, extremely difficult. But like Ury says, it’s like a muscle. The more you practice, the easier it gets. Let’s make an effort. 1 Reply to "How to Conduct Difficult Negotiations: The Six Steps"
I agree with Mr. William Ury. Very true.